You can view a variety of renovation photos that will show the before and after shots of these remodeling projects for some great DIY home design ideas. Insulating basement walls is important to create an energy efficient space that does not loose heat or cool air. You can quickly and easily install insulation by placing it in between ceiling beams as well as amid the wood studs on the walls. Once the insulation is put in you can complete the wall construction by installing dry wall. Take a look at our basement refinishing pics to see how to complete this process. After constructing basic framing and walls of your basement, the next step is to install flooring. A low pile carpet is more appropriate for basement bedrooms, bar areas, or offices as they offer more mobility rather than comfort. Because the basement is such a large space in your home, it can be used to create a variety of different rooms. Simple basement ideas include guest bedrooms, a home theater, office area, or den. House plans with basements can even use this space to incorporate a guest apartment into their home. Pictures of remodeled basements show guest suites complete with a bedroom, bathroom, kitchen and living space. Take a look at our basement photo galleries to see top design ideas in 2019 and styles for guest bedrooms and basement apartments. You can find many images of basement bathroom ideas, including small pictures of small half baths that can be used for freshening up as well as larger master suites complete with spacious showers and Jacuzzi tubs. Carpet is a terrific choice for basement flooring because it provides a lush, warm surface for an otherwise cool, rigid area. Basement carpet ideas depend on the function of the room and can range from plush high pile carpeting for lounging to firmer low pile choices for offices. High pile carpeting is great for use in TV rooms, diy home theater, or basement family rooms. If you prefer a more traditional look, consider using various types of tiling in this area. You can purchase ceramic, vinyl, or plastic tiles to use throughout your basement in an assortment of different colors and designs. A popular choice for this area is plastic tiling that is made to look like hardwood. Although the basement is a great area for guest rooms or a family living space, it is also the perfect location for a man cave. 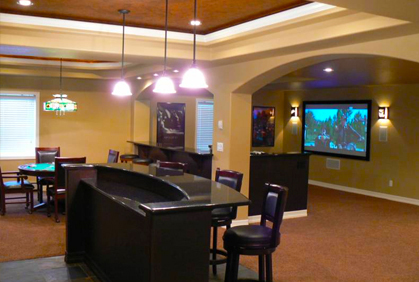 A man cave is a room or area in the home that is dedicated to the men of the household that acts as their private sanctuary to spend time by themselves, drink a few beers with the guys and watch sports. 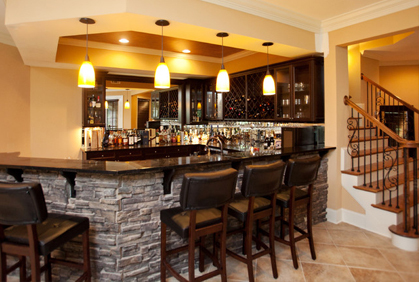 Popular man cave ideas include themes centered around a sports team, or spaces made to resemble their favorite bar and grill. 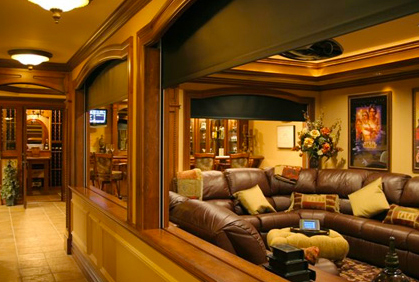 For the sports fanatic, a man cave designed around football, basketball, baseball or hockey is the perfect way to make him feel at home. Our online basement photos show pictures of the top 2020 design ideas and themes for a man cave adorned with memorable sports paraphernalia. 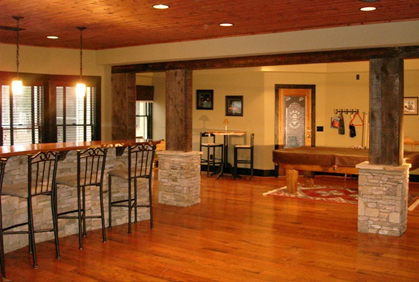 The most important feature of a renovated basement is whether or not it is finished. An unfinished basement tends to be dull and lifeless, only to be used as storage space for old items to collect dust and cob webs. However, finished basements, are more functional, providing additional rooms to the house, more design options, and increasing the resale value of your home. 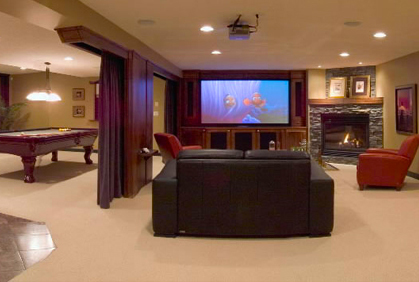 Finished basement images show homes that have transformed these formerly drab spaces into elaborate home theaters, game rooms, apartments or luxury guest suites. If you have an unfinished basement that you are looking to remodel, consider taking on this project yourself. Finishing basement walls is a relatively easy diy project that can be completed with the right tools and instructions. The basement is one of the most valuable areas in a home because they provide you with extra space for storage, as well as a place to create additional rooms in the house. The design ideas for homes with basements are endless, including plans that create a space to store extra clothing or furniture, guest rooms, or spacious home theaters and bars. 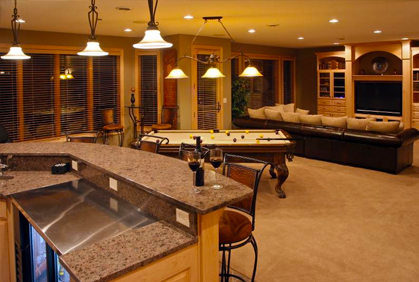 Because you have so many options to choose from, it is often difficult to decide how to renovate your basement. The best way to make this process easier is to look photo galleries of the top basement ideas and pictures. Decorating photos provide you with inspiration by showing you the various design and layout options you can incorporate into your basement.